HIPAA Privacy Notice | 8x8, Inc. If your business deals with sensitive health information, then you’ll fall under the rule of HIPAA. In order to become compliant your business must adhere to certain HIPAA regulations. However, with evolving technology trends and practices, it can be difficult to achieve and keep your compliance up to date. What Is a HIPAA Privacy Notice? The HIPAA Privacy Notice is part of the HIPAA Privacy Rule. This rule exists to help protect and inform individuals about their privacy rights related to their own health and electronic protected health information (ePHI). It’s the job of your organization to create and distribute a Privacy Notice that explains all of these rights and practices. The Privacy Rule states that an individual has a right to know how their health information is being collected, used, and protected. It’s the job of your organization to create a document that organizes these procedures, explains them in common languages, and implement the procedures. This notice also needs to be made public and available to any individual who asks to see it. This is in alignment with the HIPAA Privacy Notice distribution requirements. It also includes adding your HIPAA Privacy Notice to your website and making it easy to find. You also have to update this document any time changes to your privacy policies and procedures are made. Depending on your business you might also have to provide multiple different formats of the notice, per HIPAA guidelines. How Can Your Company Adhere to These Guidelines? To adhere to these guidelines, you’ll first need to go through the standard HIPAA compliance protocols. Before you can effectively create a HIPAA Notice of Privacy Practices, you’ll need to implement these practices into your own organization. The HIPAA Privacy Rule is more closely related to creating and following privacy guidelines, rather than other aspects of HIPAA which relate more to direct implementation. The U.S. Department of Health and Human Services (HHS) offers models and templates to help create your own Privacy Notice. 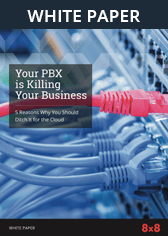 What About Cloud Communications Providers and Other Third-Party Vendors? The HIPAA Privacy Rule is pretty far-reaching. Beyond covering health plans and health care providers, the rule extends to subcontractors, software providers, and business associates as well. Basically, if your organization has access to ePHI, then you’ll need to be HIPAA compliant. So, if you’re utilizing a cloud communications provider to streamline contact management and communication across your organization, then they’ll also need to be HIPAA compliant. Part of this compliance entails making the HIPAA Notice of Privacy Practices visible and accessible, usually via a website link. Both your company and any third-party vendors need to adhere to this. It’s important to properly vet all third-party providers you’re working with. Even if you’re fully HIPAA compliant, you could still be fined or have penalties imposed if you’re using a non-compliant provider. The HIPAA Privacy Notice helps your customers, clients, and users understand how their information is being protected and how they can access it. This document needs to be displayed on your website (and potentially in other formats), in alignment with HIPAA guidelines.